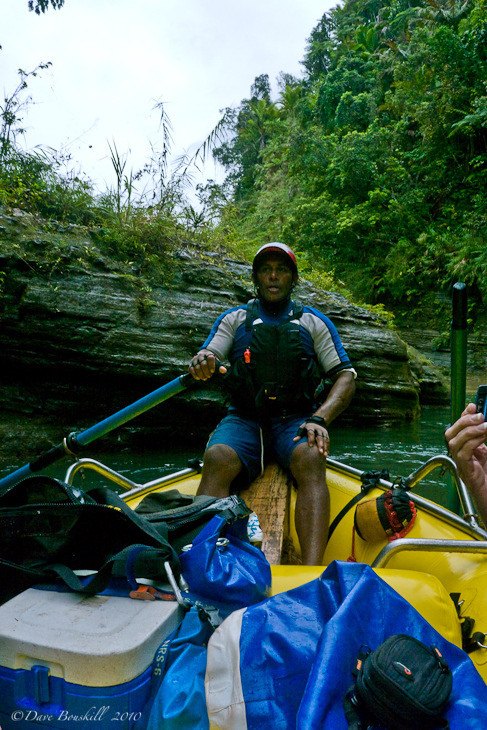 Your river guide is the “Guide with No Name,” Moses stated to us when dividing us all into groups of 4 four our White Water adventure in Fiji. Everyone else was given their guides names but Moses, the fun co-ordinator and chief in charge of us for the day, wasn't sure who we were getting. We joked that is sounded very “Zen Mastery.” Ah, the guide with no name will lead us through our journey of Fijian enlightenment down the mysterious river. All the way up the mountain to the Upper Navua River, we chatted and joked with Moses and a fun couple from the United States named Dan and Amy. 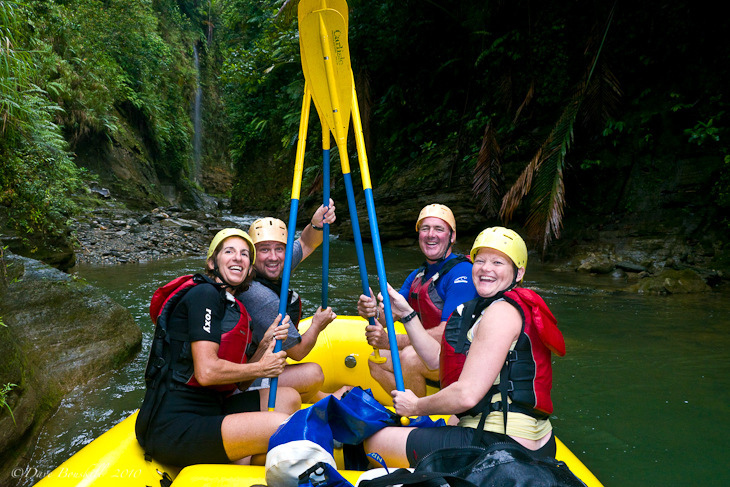 The 5 of us instantly hit is off and we were happy to be divided into the same raft with Dan and Amy for our 5-hour journey through Fiji's most beautiful scenery of deep gorges, waterfalls, dense jungle and remote villages. Moses was most likely on a kayak following along to keep us all safe. After a stop for snacks and juice part way up the mountain and with our assigned river guides names in hand, we set off for our final ascent on a bumpy road in an old mini bus to the mouth of the river. Moses must have gotten word as to who was going to guide us, as he came to us in a serious voice and said Vito was who we would be with today. Awesome, we can't wait to meet him. 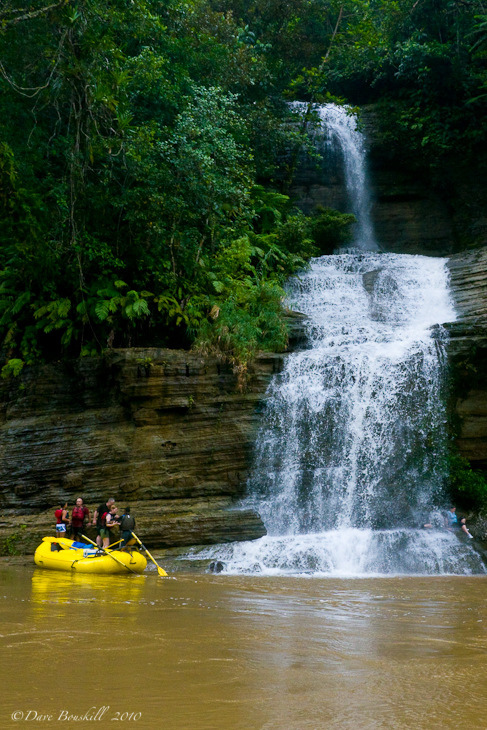 For an out of this world experience in Fiji, you really cannot miss the white water rafting adventure with Rivers Fiji. We were picked up bright and early at the Pearl South Pacific Fiji Resort for our day long excursion on the Upper Navua River. 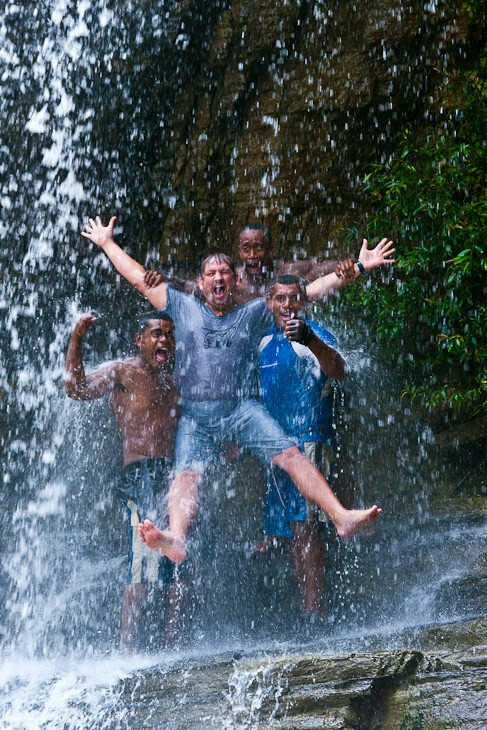 The Hour and a half very bumpy drive through Fiji's mountainous terrain viewing lush rainforest canopy was half the fun. 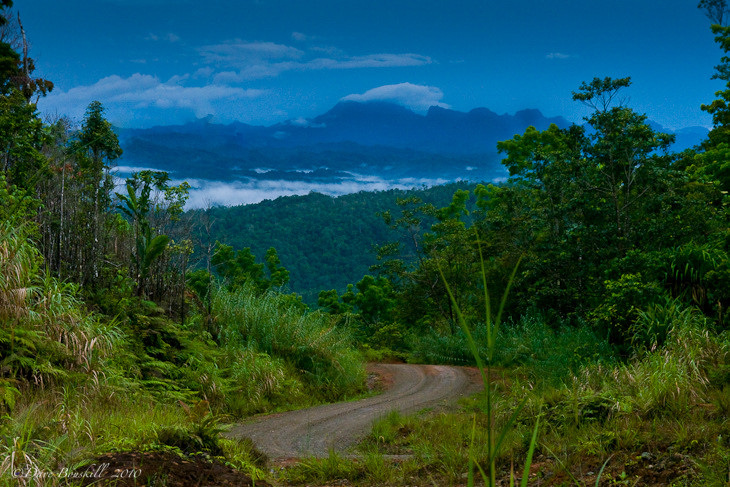 It is the rainy season on the island turning the entire landscape into a rolling display of rich greens in every shade. After an hour long journey which included a quick snack stop and a chance to take in the view we reached our final destination in the middle of the Fijian rainforest at the Upper Navua River. 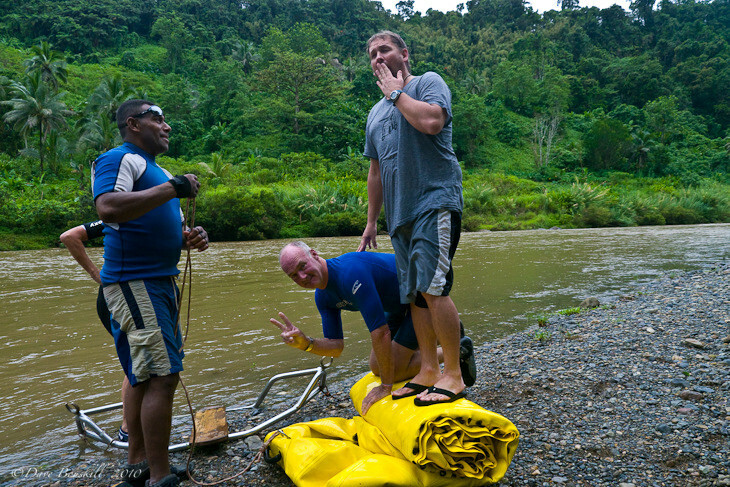 Here were given a life jacket, helmet and paddle and started our twenty minute hike to the mouth of the river. Jokes were abound as Moses told stories and laughter ensued. But once we reached the river, it was all business. It was here that we met the rest of our guides and received our safety briefing. Assume the safe swimming position of feet forward and legs straight ahead. Look where your are going and swim around or over obstacles. We then hopped into our boats. When it came time for us to pop into Vito's boat we were told that he didn't show up today. That is when it dawned on us all that Moses was going to be our guide. How lucky were we! The other rafts took off ahead of us, and Moses told us a story before we went through a series of practice strokes. Back paddle on the right and forward paddle on the left for a right hand turn and do the opposite for a left hand turn. It wasn't long before we went through our first set of rapids. Moses has been guiding this river for 12 years and his skill was perfect. 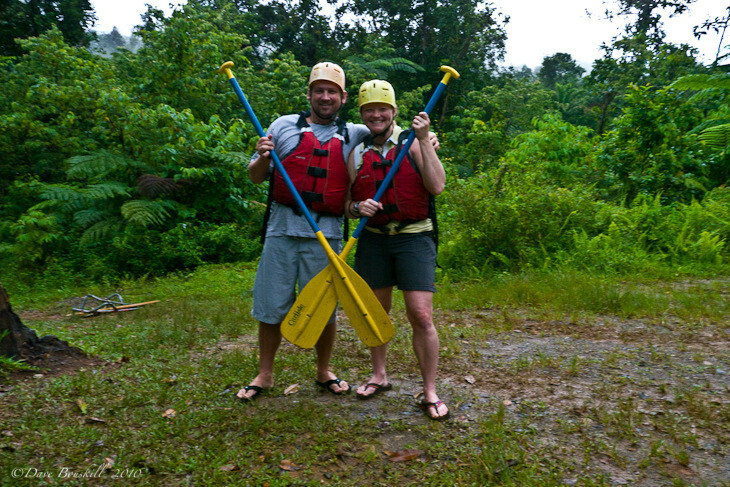 He made the journey more exciting by having us utilize our turning technique to 360 our way through class III rapids. It was thrilling and we spent our day getting soaked regularly. Not only were the rapids a joy to go through, the view was out of this world. 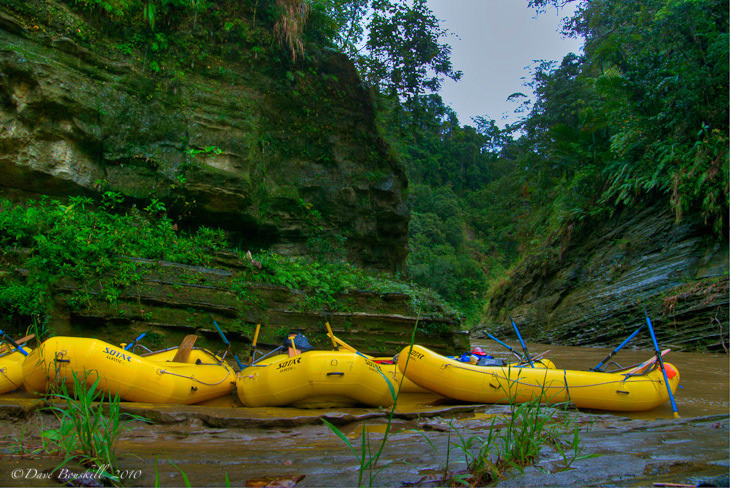 As we floated 26 km down the river, we spent half of it surrounded by deep canyons on either side. It felt like a dream to look up at the phenomenal high cliffs reaching up to 40 metres high. 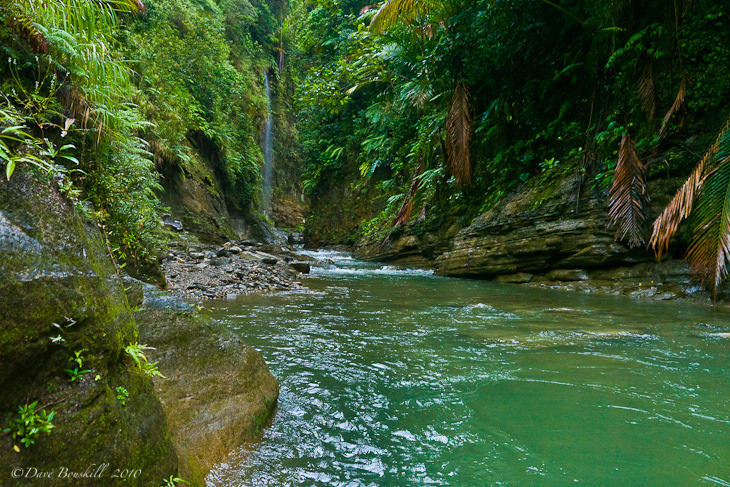 With each turn we witnessed another waterfall, each completely different from the last. Some sprayed lines of mist from high above while others spewed over with great power. Moses guided our boat directly under the waterfalls with great power so that we were thoroughly drenched and filled with great excitement. For two and a half hours we switched from thrilling rapid runs to tranquil floating through untouched landscape. From fun stories about taking Jessica Simpson and Nick Lachey white water rafting on their honeymoon in Fiji to talking of the crazy ladies from California that stood up in the middle of the raft stark naked mooning Moses while flashing the rest of the group. We also learned about village life and a great point about Rivers Fiji, that all the guides are from the local village. The operator and owner came to Fiji 12 years earlier to set up shop and had to ask permission from the chiefs of the tribes to run a river safari no the Upper Navua. After bringing some Kava and going through all the traditional procedures, the village chiefs decided that a rafting tour would be good for the area. 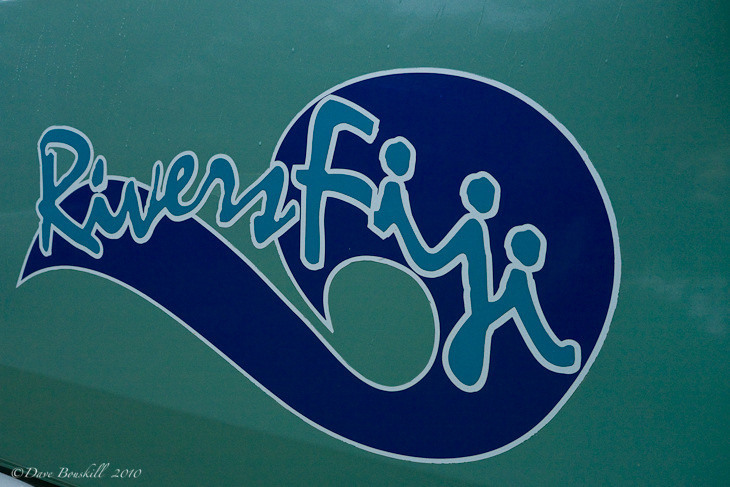 Rivers Fiji made sure to hire and train all the boys that wanted to be guides and now they are some of the most skilled river runners in all the South Pacific. It takes 5 and a half weeks to become a guide and once they are trained, they are the stars of their towns. Moses has been going since the beginning and it is very clear that he loves his career. We were the last to arrive to lunch. Moses said, we will take our time and let the others set up the tables and food. It pays to raft with the boss! Lunch was a hearty display of sandwiches with all the fixings and with our bellies full we were ready to conquer the rest of the afternoon. Making sure to bring every piece of garbage and left over food out with us, Rivers Fiji makes sure that the only thing we leave are footprints and we take nothing but pictures. One of our first stops after lunch was the “Free Massage Waterfall” We pulled our rafts up to the falls and took a slippery walk on the rocks to the falls. The guides were there to keep us from slipping. The power of the water was fierce. It pounded on our shoulders and back and it instantly explained why it is called the free massage. Not only was the flow intense, the water was icy cold taking my breath away. I only lasted for a few seconds, but Dave stayed to the end with the guides and to show off their Machismo, they posed under the falls to ham it up for my camera. Back on the rafts, we joined the other 4 rafts and spent the afternoon trying to out do one another with water fights and shenanigans. Guys tried to pull guides into the water, but only ended up falling in themselves. Dan grabbed onto a raft in front of us through a mellow section and they pulled us along for several minutes without noticing and yes, we all sprayed each other with water every chance that we had. The day came to an end and we helped fold up the rafts for storage. It was sad to see it end. We could have spent a few more days with these guys. 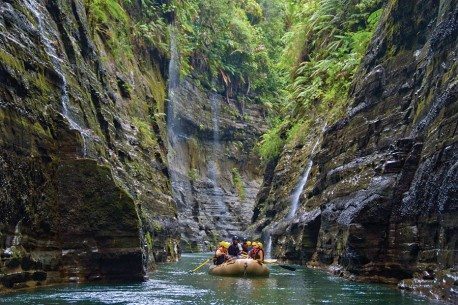 18 Responses to "Rafting the Upper Navua with Rivers Fiji"
I have been in Fiji for a very long time working in the Travel Industry. This country is such an excellent place to relax and unwind with so many resorts and fun places like the Rivers Fiji in Navua. Liked the photos. That’s nice post it can so informative for me thanks for sharing this post. Absolute perfection of a day!!! What awesome pics and Moses sounds like a hell of a guide. Stunning photos! I love how incredibly green and lush everything is! .-= JoAnna´s last blog ..5 Hotels in Vietnam =-. Hey guys! The day was so awesome and it’s great to read your version of the day and to see the photos! I still think about the Free Massage Waterfall! What an amazing day! If you guys ever make it to Brisbane, Australia let me know! .-= Melvin´s last blog ..Two Backpackers hike Volcano Pacaya – Volcano Pacaya – An active volcanoe in Guatemala =-. Aggh I missed out on so much when I was in Fiji, so jealous of you! .-= ayngelina´s last blog ..The three best hostels in Colombia =-. Looks like an awesome day and right up your alley! I hope you managed to do some video of your day in the rapids too! .-= Melanie´s last blog ..Nov 11- New York City Walking Tours – The best way to see New York City! =-. .-= Andrew Murray´s last blog ..Attractions of Arkhangai Aimag- Mongolia =-. That is stunning! like really stunning and looks like so much fun!